Looking for the best golf courses in Bend, Oregon? Look no further than the Central Oregon Golf Trail, featuring more than two dozen golf courses in the Bend and Sunriver area — with three award winning golf courses ranked by Golf Digest and GOLF magazine in the Top 100 public courses in the nation. The Central Oregon Golf Trail provides easy access to 21 spectacular courses, all in close proximity to Bend, Oregon. Stunning Pacific Northwest scenery with 300 days of annual sunshine and a dry climate make Central Oregon the ideal high desert setting for world-class golf from spring through late fall. To get the most out of your trip to Central Oregon, begin by using our Complimentary Concierge service to create a custom golf package that's just right for you. 541-593-1221 Resort Robert Trent Jones Jr.
541-593-4402 Resort Robert Trent Jones Jr.
Black Butte Ranch is a destination golf resort community in Central Oregon seven miles west of Sisters. The Ranch offers two eighteen-hole golf courses, vacation rental homes, including cabins, houses and condos. Black Butte Ranch has numerous Central Oregon outdoor recreation activities including tennis, biking, swimming, fishing, horse rides. The Ranch hosts weddings, family reunions, holiday parties and other special events throughout the year. 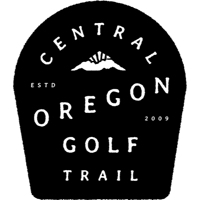 Watch the Central Oregon Golf Trail Video.